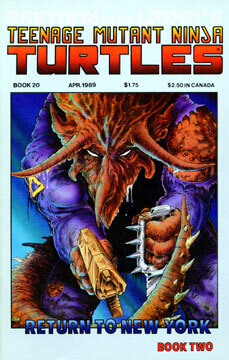 We learn that the Triceraton warrior is named Zog, who has somehow managed to survive the destruction of the T.C.R.I. building in TMNT #7. Zog is not in good shape, however. The Earth’s air is slowly eating away at his mind, driving him insane and making him sick. The alien’s misfortune is good luck for the Turtles, as Raphael has managed to convince Zog that they’re on the same team. Zog thinks that Raph is his Commander Zoraph and that the other Turtles are aliens out to help the Triceratons take control of the planet. Raphael convinces Zog that the Foot are their enemy, so the Triceraton is an eager and willing soldier against Shredder and his Foot Clan. Zog leads the Turtles to a spot in the sewers and begins to stomp his huge foot on the ground. With little trouble, the gigantic warrior manages to smash a hole into the floor and he drops through into a control room being operated by the Foot. The TMNT follow and quickly take charge of the room and the computers within. Don scans the Foot’s database and discovers that the entire block is a front for Foot headquarters. After briefly studying the schematics of the fortress, our heroes hatch a plan of attack. The Turtles and Zog cut their way into the fortress, which is disguised as a huge bank. Don has arranged for the computers to set off false security alarms, to cover their tracks. As the team makes their way to where they believe the Shredder is hiding, they lose their bearings and make a wrong turn, entering a practice room full of Foot. A brief fight breaks out and Zog cuts down a large amount of Foot Soldiers with his rifle. Don apologizes for the wrong turn and the boys head into a loading dock. They find some more Foot working and another brief battle erupts. The lads commandeer a truck from the dock and race further into the fortress. Almost immediately they’re met by gun-toting Foot soldiers and a firefight breaks out. Donatello crashes the truck and the Turtles and Zog leap out to engage the Foot in hand to hand combat. Zog is a killing machine, but he’s wounded numerous times in the skirmish. Thanks to Zog’s efforts, the TMNT are win another quick victory. After the battle, the Triceraton stumbles down a hallway, rallying the Turtles to follow him… unfortunately the giant alien has too much of a lead on the Turtles and he enters a deadly room alone, where he is cut to pieces by a shadowy figure that appears to be the Shredder. On the final double page spread we get our first look at Shredder’s Elite Guard: three monstrously mutated ninja warriors decked out in Shredder’s gear!